Last night’s dinner was one of the best I’ve had in a long time, and it didn’t even take too long to prepare! 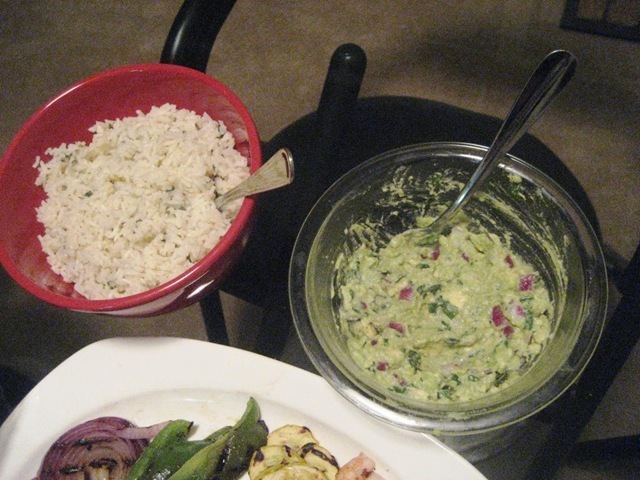 I defrosted the leftover Simmered Black Beans, made some Guacamole, Cilantro Rice, and Grilled Veggies and Shrimp for an amazing Fajita Spread. 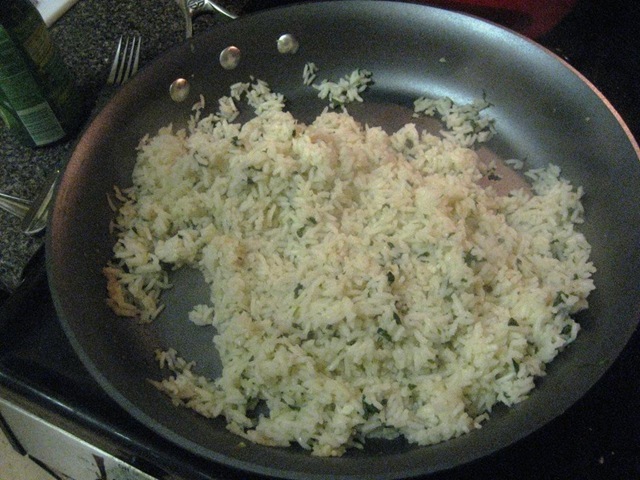 The Cilantro Rice was out of this world – very similar to Chipotle’s Cilantro Rice. The printable recipe can be found here. 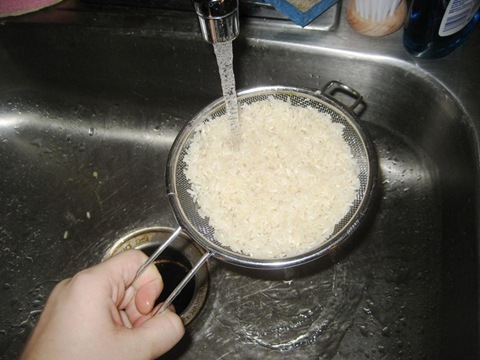 First, you rinse the rice under cold water. 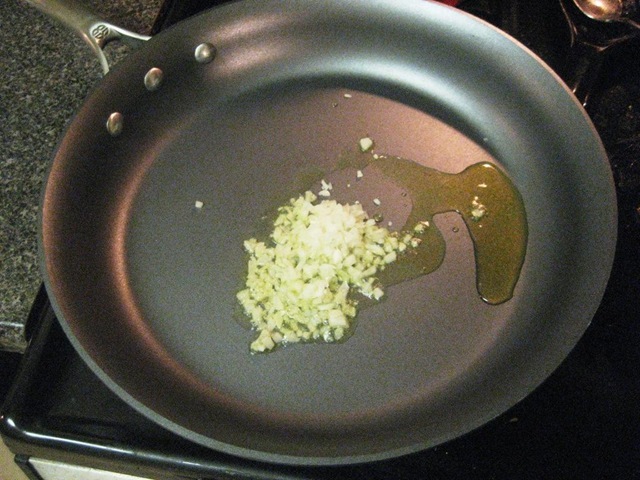 Then you heat the olive oil in a skillet and add the onion. 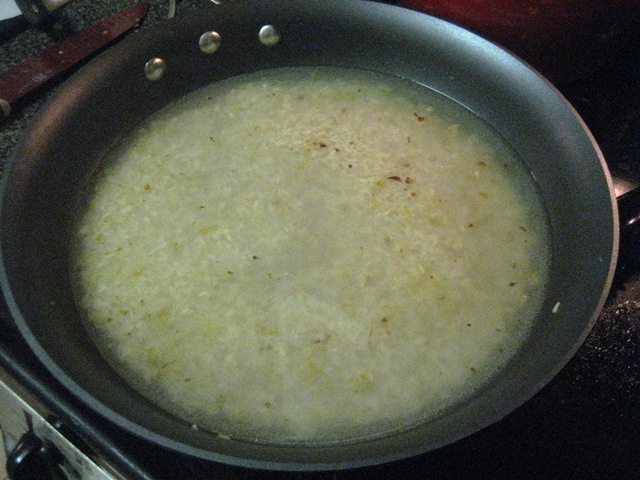 Once that gets soft (3 or so minutes), add in the garlic and cook until its fragrant (around 1 minute). 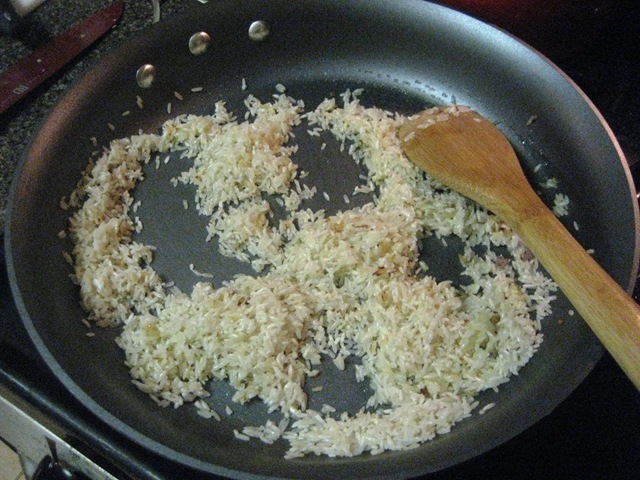 Then add the rice to the pan. Cook together for another 2-3 minutes, and then add the 2 cups of water. Once that comes to a boil, add in your salt, cover it, and let it cook for 15 minutes. 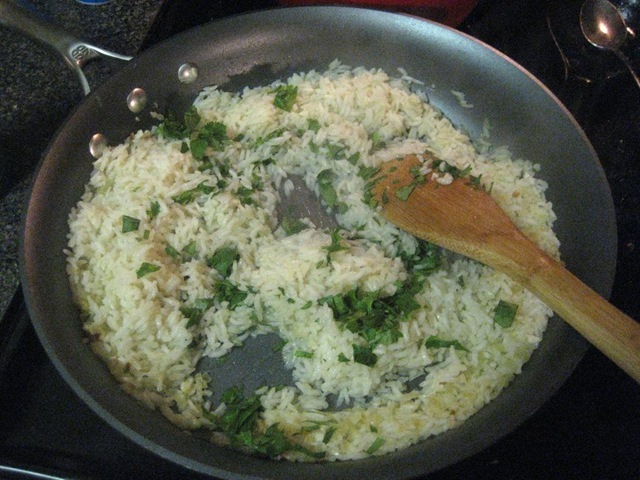 Then add 2 tbsp lime juice and a handful of chopped cilantro (as much or little as you want). Mix around and cook for another 2-3 minutes covered until all the water is absorbed, and then you’re done! For the guacamole, I used 1 avocado, juice from half a lime, some chopped red onion, cilantro, and salt. 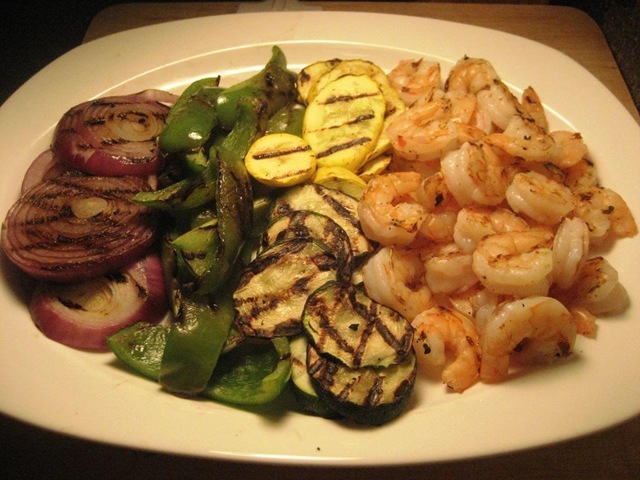 The veggies and shrimp, grilled indoors on my grill pan. Plus salsa (from the store), cheese, sour cream, and corn tortillas. Plus more. 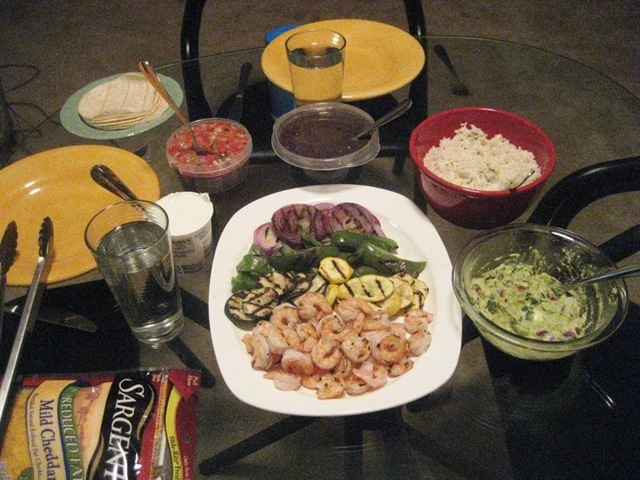 I didn’t have any cheese or sour cream, but loaded up on rice, beans, shrimp, veggies, guac, and salsa. Plus one unpictured corn tortilla (the only one left!). 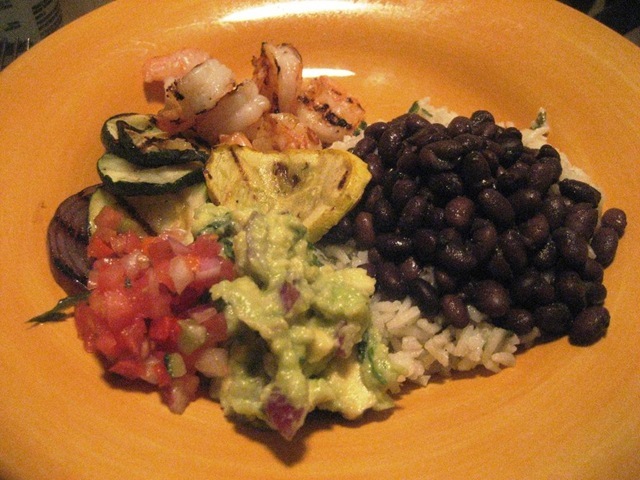 What is your favorite Mexican condiment? Salsa, sour cream, guac, cheese? For me its a tie between pico de gallo and guacamole. I just love the way they taste with everything! I love, love, love a super spicy, super thick salsa. I also love using lime and cilantro in everything Mexican. Yum. I “almost” feel like I’m in Chipotle after reading this. The sour cream and guac at Chipotle tie for first with me. this looks perfect!! I am not a cilantro fan, but everything else is my favorite! 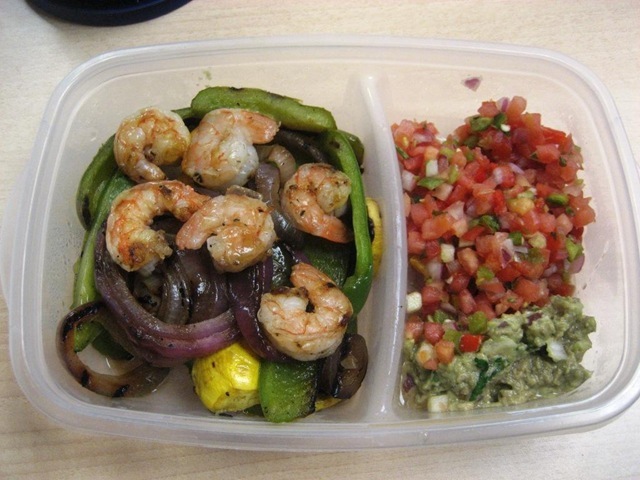 I used to not like fajita veggies, but I am so happy that I do now… they are so flavorful. Man I absolutely ADORE cilantro. I know it’s one of those things you either love or hate because its so strong! Really pretty grill marks! Did you use anything to season the vegies or are they just plain? Thanks! My grill pan is awesome. The veggies are just plain actually! Don’t make me choose between salsa and guacamole! Looks amazing! Now I want to go home and make this tonight. That looks DELICIOUS! 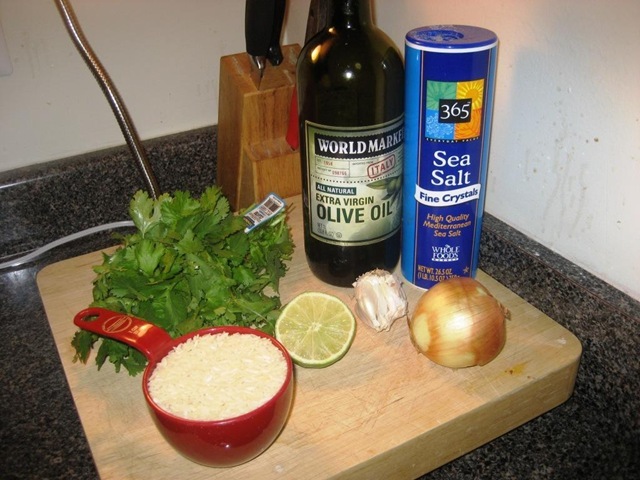 I love salsa – it is hands down my favorite condiment! That literally looks amazing!!!!! I wish I had a grill pan or just a grill b/c those veggies and shrimp look awesome 🙂 You’ve inspired me to make Mexican sometime soon!! That dinner spread looks fantastic! My favorite mexican condiment is guacamole. Could you tell me what brand/kind of grill pan you use? That all looks so delicious! 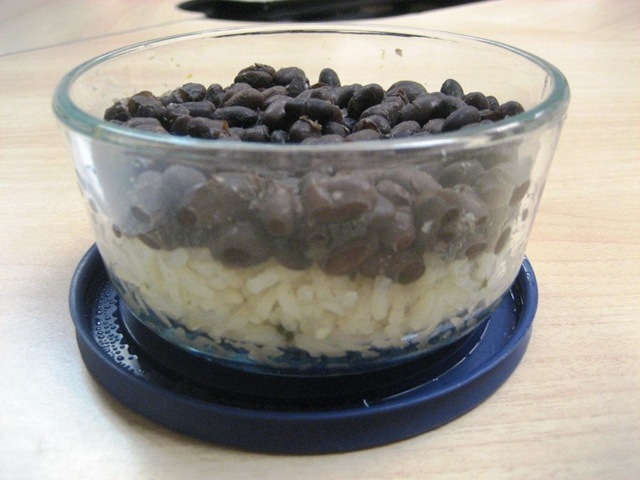 Black beans are seriously my number one favorite, whenever we have lunches at work and mexican food is brought I am the happiest girl ever, ’cause I know there are always beans involved. I loved how you made enough food for leftovers the next day. It’s so awesome not having to pack a lunch, just bringing last night’s dinner. Sweet! Love salsa 🙂 I will use almost anything to get into my mouth! Oh my goodness, your dinner looks amazing! I have a big love obsession with Chipotle and this looks like an amazing healthy version of good ol’ Chipotle! Guac is for sure my fave! Wow…your dinner is making me hungry. It looks sooo good! I love foods with lots of color in it.